John Harding has lived and worked in Saudi Arabia, Kuwait, Singapore, Italy, Jamaica and Belgium. This includes work for the largest OPEC member, Saudi Aramco, a position as Deputy Assistant Commissioner of Inland Revenue in Singapore’s civil service, and a Wall Street investment analyst. A book, ghostwritten by John, has been sold by Mark Wolper to Warner Bothers. John has been a professor at Pratt Institute of Technology’s Graduate School of Engineering in New York City, at King Fahd University in Dhahran, Saudi Arabia and John Cabot University in Rome, Italy. He has also worked for the United Nations Development Programme as a U.N. Expert in Kingston, Jamaica, and as a consultant to the United Nations Secretariat in New York. A native-born American, John speaks Italian, French, and Spanish, Jeddah-Street-Boy Arabic and spices his conversation with a wealth of Yiddish expressions—thanks to all his Jewish stepmothers. John is the co-author of Escape from Paradise, Amazon’s best-selling book for Singapore. For years it was assumed the book had been banned in Singapore. Only recently, did Singapore’s Media Development Authority MDA confirm by email that Escape from Paradise had never been banned. Escape from Paradise was not banned by Singapore, but by a lawyer, Helen Yeo. Her husband, Yeo Cheow Tong, was formerly a Singapore cabinet minister and, consequently, Helen Yeo had a lot of clout. The reason for Helen Yeo’s pushing to get Escape from Paradise banned was that she was afraid that it might lead to expose a property transaction in which she was involved or was she bribed? Escape from Paradise did nothing to expose her, and mentioned her only in passing. However Helen Yeo did not want to take the risk that someone might connect the dots if any existed. Helen Yeo was formerly the Managing Partner of Rodyk & Davidson, a Singapore law firm. She no longer holds that position. Her husband, Yeo Cheow Tong, is no longer a Singapore Cabinet Minister, nor is he a Member of Singapore’s Parliament. Escape from Paradise is now being made into a movie, and, of all people, John Harding is doing the screenplay and is listed on IMDb. In the works – Escape from Paradise – now the movie! 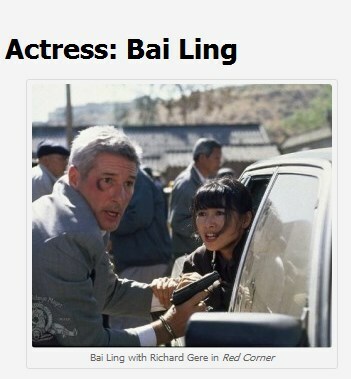 Bai Ling who starred opposite Richard Gere in Red Corner has signed on for the lead role in Escape from Paradise, the movie. Here is how my fantastic stepmother, Isobel Lennart, got her start as a screenwriter. She went on to write a number of films, including Love me or Leave Me & Funny Girl. (note the then unknown Ava Gardner got her start, as well)!